Spalling is when brick masonry begins to deteriorate to the point chunks of brick are falling from the structure. Spalling starts off as small cracks that grow into bigger cracks until the entire surface deteriorates. If left untreated this condition will worsen until it interferes with the overall stability and safety of a building. Once bricks began spalling in one location, it increases the risk surrounding bricks will do the same. That’s why it’s so important to fix the problem as soon as it arises. 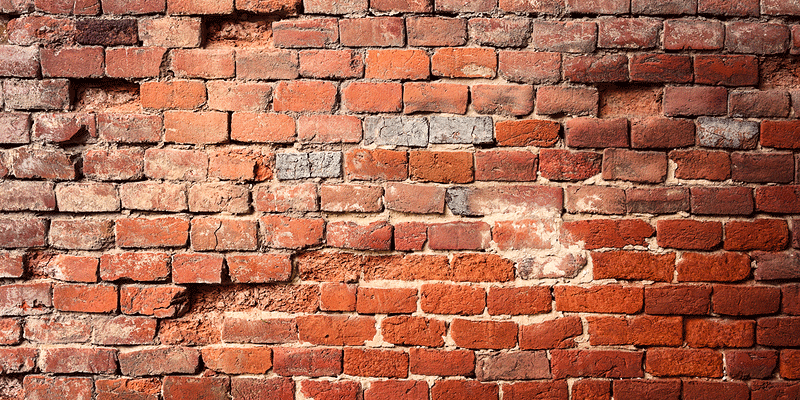 Many things contribute to spalling bricks, but the most common source of damage is water. Water can erode surfaces and weaken masonry. When too much water becomes trapped inside of masonry structures it causes what is known as the freeze/thaw cycle to occur. When temperatures cool down, moisture expands and freezes and when temperatures heat up water thaws and decreases in volume. When this process occurs over and over again it puts excessive pressure on masonry, causing it to crack and eventually spall. Water can lead to spallling in a number of ways. One, if rainwater constantly makes a direct hit with surfaces it will eventually begin to degrade brickwork. Secondly, if poor drainage causes water to consistently spill from the roof down over surfaces it will erode the wall, chimney or other brick surfaces over time. Thirdly, water may be absorbed through consistently wet soil (rising damp), which may also relate to water entering the foundation of your home. Moisture may also enter through something as seemingly harmless as water vapor. Non-breathable sealants are commonly thought to help prevent water getting inside of masonry but that’s not exactly the case. Brick masonry is very good at absorbing water and releasing water through its natural pores. But, when a non-breathable sealant is applied over masonry it is no longer able to breathe or release any pent up water. Therefore, any water trapped inside or any water that finds a way in remains trapped there indefinitely. If you splash water on masonry and it beads up you know surfaces have been sealed, but you do not know if a breathable sealant was used or not. Improper bricks placed at or below grade level. If you notice that only bricks located at or below grade level are spalling it is likely because improper bricks were placed here. High-pressure cleaning with water or sand can cause considerable damage to bricks. Masonry that is harder on the outside with a softer core is going to experience the most damage from this form of treatment. The amount of damage that occurs relates to how many freeze/thaw cycles take place, the amount of water, as well as the porosity and permeability of the brick. Some bricks are denser throughout while others are tougher on the outside but softer towards the inner core. In order to identify the extent of damage you can tap on spalled surfaces and then measure where the damage appears to cease. If crumbly surfaces extend three-quarters of an inch or more deep, it is likely impacting the overall stability of the wall. In which case, more severe measures will need to be taken to repair and preserve the structure. Even if the damage doesn’t appear to be that serious it will only get worse without quality repairs. If the problem is caught during the earliest stages it is far less extensive to fix, and you greatly reduce the risk that spaling causes irreparable damage. As long as the issue isn’t past repair, an experienced mason can typically address the issue by cleaning out damaged bricks and replacing them with new bricks and well-matched mortar. This process must be conducted with great attention to detail and the proper tools, as well as mortar and brick that match original materials. Otherwise, your risk paying for repairs that actually cause more damage to the structure. In some cases, if only the front side of the brick is damaged, the brick can be turned around and reused. Before any repair work is conducted it’s important to identify and solve the cause of the problem or else the issue will persist post-repairs. Once you have identified and solved the original cause of spalling bricks you should be able to prevent the issue from occurring again. Preventing spalled bricks includes installing quality drainage systems to move water away from masonry structures. Adding a breathable sealant to bricks as opposed to a non-breathable sealant is also important. Contact Turnbull Masonry for a free estimate to fix spalling bricks on buildings, chimneys, retaining walls or any other structure.